Voices from the Field: SPECIAL vol.9 Disaster Prevention through Connecting Affected Local Communities. / ► SPECIAL vol.9 Disaster Prevention through Connecting Affected Local Communities. SPECIAL vol.9 Disaster Prevention through Connecting Affected Local Communities. In August 2011 elementary school children from Noda Village in Iwate Prefecture, an area affected by the Great East Japan Earthquake, were invited to Kobe to spend a few days during their summer vacation. This event was mainly organized by university students in Kobe studying disaster prevention and a citizen volunteer group “Kataribe Kobe 1995”, which I had established in cooperation with the victims of the Great Hanshin –Awaji Earthquake. Kataribe Kobe 1995 (referred to hereafter as Kataribe) is a group whose mission is to pass on personal experiences and lessons learned from the Great Hanshin –Awaji Earthquake through storytelling and oral history. Seventeen years ago, when the Great Hanshin-Awaji Earthquake occurred, all the members of Kataribe were suffering the immediate aftermath of the earthquake. Even now they have not completely overcome their pain. Their hard experiences led them to Noda Village. They wanted to tell the people in Noda Village what they had experienced in the earthquake and how they lived their 17 years. At that time, seventeen years ago all of today’s university students volunteers were under school age. They have dim memories of the Kobe earthquake. Education is their substantial source of knowledge about the earthquake. These facts, however, strongly motivated them to encourage the children at Noda Village as they continue to live on after a major disaster. The university students brought photo albums to the children of Noda Village as their gifts. The photos were taken in Kobe during the children’s summer visit and compiled into an album for each child. It is hoped that the children would treasure these one-and only albums all through their lives. This year at 5:46 am on January 17th, at the same time as the Great Hanshin –Awaji Earthquake had struck seventeen years ago, I was at Higashi Yuenchi Park in Chuo Ward of Kobe City, where an annual memorial ceremony was held. Some residents of Noda Village attended the ceremony, including Mr. Masaru Onodera who is a member of the Board of Education at Noda Village, and who had led the school children to Kobe during their summer vacation. The Nippon Volunteer Network Active in Disaster (NVNAD), of which I am a member, invited them so they could personally experience the annual January 17th memorial. Furthermore in February 2012 I invited Mr. Onodera to Okitsu district at Shimanto Town in Shikoku and to Suma Ward in Kobe City and asked him to talk about the experience of the March 11 earthquake and tsunami. 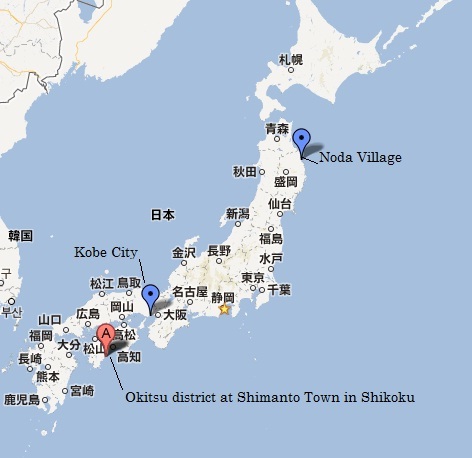 Okitsu district is the village where I have been engaging in tsunami preparedness project with the residents for many years. Recently Japanese Government Panel has announced the highest estimated tsunami could reach over 25meters in Okitsu in case of the earthquakes along the Nankai Trough. As this area is vulnerable to tsunami, I have long wanted the residents to have a chance to listen to the experience of March 11th directly from the victims. My wish finally came true. At the other location in Suma Ward of Kobe City, a district which was severely damaged by the Great Hanshin-Awaji Earthquake, a member of Kataribe serves as a leader of a community association at Suma Ward in Kobe City. According to this person, these days residents often move in and out in this district and he expressed concerns that public awareness for disaster prevention has been diminished. So I requested him to organize a meeting where Mr. Onodera could meet and talk with the residents. I am sure this helped remind the residents of the importance of disaster prevention. I also appreciated the fact that a resident in Suma Ward who is originally from Noda Village participated in the meeting. Recently natural disasters such as earthquakes, typhoons, and floods have been very frequent .While I hope their frequency will decline; I also think we need to take some measures to create better conditions out of hard realities and learn a lesson from disastrous damage. A lot of disasters in Japan have brought forth many people who have vivid memories of their trying experiences. What is important is to pass on the victims’ experiences from one place to another, from generation to generation, from person to person before those memories perish. This is why I am trying to bridge the various disaster affected areas; from Hanshin- Awaji to Tohoku, from Tohoku to Hanshin area and then to Shikoku. This determination also led me to develop a plan to make links over time as well, from the past to the present and to the future. On March 11th, 2012 I was at Noda Village. I had already visited Noda Village more than ten times since the disaster. I saw Mr. Onodera and other members with whom we had deepened ties since last summer. One year had passed since the earthquake. Outside of the hall where a memorial service was being held, icy snow was falling. Re: SPECIAL vol.9 Disaster Prevention through Connecting Affected Local Communities. - " ... January 17thmemorial." Probably a space is missing between 17th and memorial -> "January 17th memorial"
-" ... the experience of the March 11th.earthquake and tsunami." There is a dot between March 11th and earthquake. Probably shouldn't be there. Appart from that I think it would also be possible to write "... March 11 earthquake and..." or "... experience of the earthquake and tsunami from 11th of march." Thank you for your kind comments. I corrected. Your understanding is greatly appreciated.